The Blohm&Voss Ski Cup 2015, presented by high-performance ski brand Foil, will once again bring superyacht stars to the slopes during the Superyacht Design Symposium. The Cup will be the highlight of an exciting programme of alpine activities, following the last session of the Superyacht Design Symposium. The designers, superyacht industry executives and owners that take part in the exciting debates and discussions during the Symposium can then head to the slopes for competition and celebration. Guests will be transferred to the popular ski area of Oberndorf in Tirol – a charming village in the heart of the Kitzbühel Alps set halfway between St. Johann and Kitzbühel. There they will take part in competitive skiing, winter games, music, Foil ski trial sessions and the all-essential après ski that will entertain ski enthusiasts and non-skiers alike. 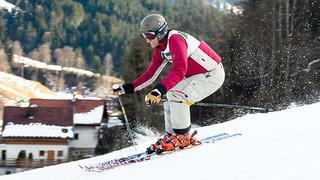 Intermediate and advanced skiers will have the opportunity to participate in an exhilarating giant slalom ski race. Andreas Pichler, a former Austrian ski racer, will be the first to carve his way down the mountain on his Foil skis – setting the time for competitors to beat! With the fastest skier winning a fully customized pair of Foil skis and prizes awarded for style and enthusiasm, it promises to be an adrenalin-filled afternoon of good-natured competition and fun. Over the course of the afternoon, there will also be opportunity for Symposium guests to try a pair of Foil skis and experience the perfection in movement, grace, elegance and strength that this brand provides. Those who do not wish to participate can cheer on the skiers from the comfort of our very own après ski lodge! At the bottom of the slope close to the finish line, the après ski area will provide spectators with a prime viewing spot for the race, complete with live commentary and music, as well as delicious Tyrolean treats, fine wines and prosciutto provided by Foil. A selection of fun winter activities will also be available to non-skiers. The Superyacht Design Symposium comprises two days of design-focused presentation and debate at the exclusive Bio-Hotel Stanglwirt. A collection of the world’s leading yachts designers and internationally renowned creative talents from outside of the yachting world will take to the stage to share their experiences and contribute to a diverse range of topics.